Was B-52’s ejection seat a lifesaver? You are at:Home»Air Force»Was B-52’s ejection seat a lifesaver? 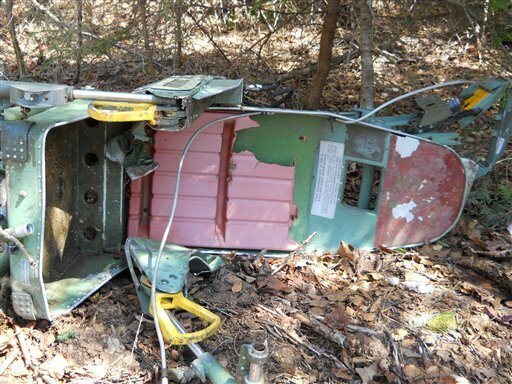 A Maine resident says he’s sure that an old plane ejection seat carried off a western Maine mountain a couple of weeks ago belongs to an Air Force B-52C trainer that crashed in 1963, according to the Bangor Daily News. Pete Pratt, who belongs to a club behind a memorial to the crash, said he will contact the airplane or seat manufacturer to see if serial numbers taken from the historical find can be traced to its position within the jet plane, the Bangor paper reported. He wants to know if the person who was in the seat was one of the crash survivors. The state’s Forest Service said that ranger Bruce Reed found the seat on an overgrown logging road while hunting last fall on Elephant Mountain near Greenville, The Associated Press reported. Reed returned to the site May 19 to take photos and record identification numbers to confirm it came from the B-52. A recovery team retrieved the seat May 24. The unarmed B-52 went down Jan. 24, 1963, while on a training mission out of Westover Air Force Base, Mass. Seven airmen were killed. The forest service says the seat is the one that probably saved the life of either the jet’s pilot or its navigator. According to a regional tourism website, pilot Lt. Col. Dante E. Bulli ordered the crew to eject when the plane’s vertical stabilizer fell off and he could not bring it out of a dive. “The navigator, Capt. Gerald J. Adler, ejected first, followed by Bulli and the copilot, Maj. Robert J. Morrison. Time did not allow the others to escape before crashing into the side of Elephant Mountain at 2:52 p.m, They were: Lt. Col. Joe R. Simpson, Jr, Maj. William W. Gabriel, Maj. Robert J, Hill, Capt. Herbert L. Hansen, Capt, Charles G. Leuchter, and T-Sgt. Michael F. O’Keffe. Morrison was killed when he hit a tree while parachuting to the ground a mile away.